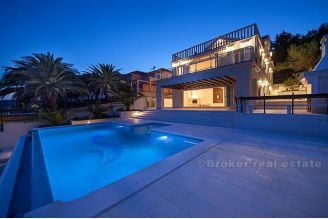 Croatia,Rogoznica - Superb luxury villa first row to the sea, at great location. Croatia, Rogoznica - Superb luxury villa first row to the sea, at great location. This exceptional and luxury villa with swimming pool is situated in an excellent location, in a quiet bay, first row to the sea, in the most beautiful part of Rogoznica. It was built in a minimalist style, on a 800 m2 plot and spreads over three floors with 340 m2 of living space. On the ground floor is a garage with parking spaces for five vehicles. The first floor consists of a spacious living room with fitted kitchen,, bedroom with private bathroom and toilet. All rooms have direct access to the covered terrace with barbecue and access to the pool. The second floor consists of two bedrooms, each with private bathroom. The master bedroom has a walk – in closet. Each room has a private balcony which offeri stunning sea views..
Cultivated garden is carefully designed and enriched with Mediterranean herbs whose scent you enjoy walking down the stone paved paths. Stairs, from the terrace, lead directly to the pool, which has the heating system, and space for sunbathing where you can completely relax and enjoy. The whole house is air conditioned, has underfloor heating, solar heating system, security doors, video surveillance and electric shutters. Beautiful location, right by the sea, spacious garden with a swimming pool, exceptional design, quality construction and the proximity to all facilities make this villa ideal for a complete holiday where you can relax and enjoy in full harmony with almost untouched nature. There is not traffic in front of the house, as house is located at end of dead end road. There is a possibility of purchasing the adjacent plot of 800 m2 where you can build another villa, just behind.